Over the past few years there has been an increase in the number of pets intoxicated by marijuana presented to veterinary clinics. It is unknown if this is truly an increase in cases, if people are more willing to seek veterinary care due to changing attitudes about marijuana or if more potent forms of marijuana are prompting pet owners to seek medical attention. While most marijuana exposures more than 10 years ago were due to ingested plant material, today exposures to edibles (such as cookies, brownies, etc.) and cannabis concentrates (such as wax and shatter) are much more common. These products have much higher levels of tetrahydrocannabinol (THC), the main psychoactive ingredient in marijuana. While both dogs and cats are willing to ingest plant material, dogs are more likely to consume edibles. Many of these products also contain chocolate, which can make the clinical signs worse because chocolate is also toxic to dogs. 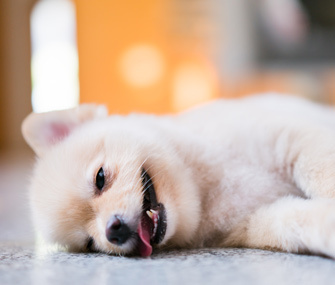 The most common clinical signs in pets after ingesting marijuana in any form are “drunkenness” (where the animal may appear uncoordinated, dazed or sedated), depression or urinary incontinence. However, about 25 percent of pets become stimulated (signs include agitation, vocalization and high heart rate) instead. Animals that ingest edibles can be more affected and develop low blood pressure, low heart rates and low body temperatures and become comatose. There have even been some dog deaths after eating cookies or brownies made with marijuana butter. Inducing vomiting in pets can decrease the severity of the signs. However, this must happen quickly after ingestion, as marijuana has anti-vomiting properties. Do not attempt to induce vomiting if your pet is already acting dazed or sedated. If your pet is unable to walk or cannot be roused after ingesting marijuana, please contact your veterinarian immediately. Pets are also ingesting synthetic marijuana. Synthetic marijuana, or more precisely synthetic cannabinoids (CBDs), are chemicals synthesized in laboratories that mimic the effects of THC. These compounds are sprayed on plant material and sold as potpourri or herbal incense labeled “not for human consumption.” They may also be sold as a liquid for use in e-cigarette-type vaporizers. These products are available through the Internet and at gas stations, liquor stores and head shops. Clinical signs in pets are similar to traditional marijuana exposures except cardiac signs appear to be more prevalent and seizures have been reported. CBDs do not have the psychoactive properties of THC, and some CBD-containing products have claimed to be safe. However, at this point, more research is needed. There is no known appropriate dose for pets and the ASPCA Animal Poison Control Center has seen dogs develop the same clinical signs after ingesting CBD-only products as from ingesting THC. Treatment of marijuana ingestion centers around making sure the heart rate and blood pressure remain normal. Very sedated animals may need intravenous fluids to help keep up their blood pressure, while agitated animals may need sedatives to decrease their blood pressure. Pets who are unable to walk or are comatose need to see the veterinarian immediately. Prognosis in most cases is good, but ingesting chocolate along with marijuana can be more difficult to treat.